I made a passing comment about Nikon picking too small a sensor for their mirrorless system, and that got a fair amount of feedback from site readers, so perhaps I should put some more flesh on my comment. Personally, I think both are true. Though the first statement is clearly true today I don't think the second statement will be true for at least a few more generations, maybe more. Compact cameras themselves are being squeezed upwards. With competent cameras in most current smartphones, a compact camera can only distinguish itself by "bigger sensor, more lens, more performance." The compact camera makers are attempting to meet the smartphone challenge in three ways: (1) tough cameras (waterproof, crushproof); (2) big lens cameras (10x or wider zooms); and (3) larger sensors (e.g. the Canon G1x, the upcoming Sony, and more to come). It's that last bit that's the Nikon 1's problem. With m4/3 sized sensors in compacts and APS sized sensors coming, the top end compacts end up being bigger sensored than the Nikon 1, and by a tangible amount. 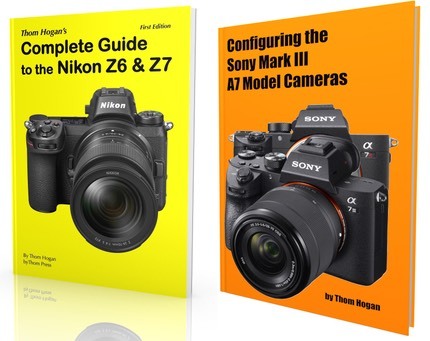 Sure, Nikon will have a slight price advantage (which they haven't yet shown they're willing to take advantage of), but the bigger sensors will have advantages they can't match. Indeed, think about the Coolpix P7100 followup. With Canon now having the G1x with its basically 4/3 sensor, a Coolpix P7200 with a Nikon 1 sensor seems just a bit small (especially with Sony coming into this game with an APS sensor). True, Nikon has phase detect on the sensor and that makes for fast autofocus. But that's a temporary advantage. Others will put PD on the sensor, too. At that point we're stuck with small versus large. Meanwhile, Nikon appears to be putting more emphasis on FX sensors. Come fall, we'll see a D600 (entry FX), D800 (megapixel FX), and D4 (performance FX) DSLR from them, it seems. That entry FX DSLR will come in at a price point that was originally where the high-end DX camera sat (and adjusted for inflation, even lower). The clear implication is that Nikon thinks they can apply economies of scale to bring FX prices down. Personally, I didn't think that would happen until 2015 at the earliest, but it will happen—it's inevitable in tech for parts costs to come down, though and entry FX DSLR would mean Nikon is pushing faster than the predictions. Where does that leave the Nikon 1? Competing as a compact camera, basically. They're running one stop or two stops smaller than the rest of the competition. That's exactly the position that Olympus was in with 4/3 back in the last decade: one stop smaller than the rest of the competition. As I wrote then, it's not the right strategy. Perhaps Nikon knows something the rest of us don't. They did get to phase detect on a big sensor faster than anyone else. Perhaps they see a technology on the near horizon that means that they won't be so deficient, after all. For example, if Nikon could put their patented non-Bayer design into a 10mp Nikon 1 sensor (with phase detect, too ;~), that would be a strong move as long as everyone else stayed Bayer. Does my comment about Nikon picking too small a sensor mean that the Nikon 1 is going away any time soon? Not at all. Nikon has a lot of ways of dealing with this. As I just noted, the may have a technological solution (slightly doubtful), they could use price (likely), or they could just try and tough it out by iterating the sensor quickly, amongst other possibilities. In short, I believe Nikon put themselves in a slightly awkward position. They'll need to execute well to make up for that.